Although Ontario roads are reputed to be among the safest in North America, the sheer number of vehicles on our roads translates into a significant number of car accidents, cycling accidents and pedestrian accidents occurring annually. The Ontario Government reports that one person is killed every 17 hours on Ontario roads, on average, and about 25 per cent of road fatalities involve pedestrians and cyclists. Further, a substantial number of accidents and fatalities can be attributed to distracted driving and notably, the use of cell phones while driving. Ontario’s Minister of Transportation, Steven Del Duca, just announced that Ontario plans to implement new laws in the fall of 2017 that will attempt to reduce the incidence of distracted driving accidents, injuries and deaths. Introduction of a new offence for careless driving causing bodily harm or death. Penalties for this offence include driver’s licence suspension, fines and imprisonment. Stricter penalties for distracted driving. This means that a driver using their cellphone while driving can expect to receive a higher fine, and increased demerit points and driver’s licence suspension. Drivers failing to yield to pedestrians will experience increased penalties, particularly drivers convicted of multiple such offences within a 5-year period. The province is also considering an initiative to use cameras on school buses to capture drivers on video who are illegally passing a school bus. This video evidence may then be used in court, without the need for a witness. The proposed changes to Ontario legislation to crack down on distracted driving serves to remind all drivers to set aside their cell phones while driving and avoid any other activities that prevent them from focusing on the road and other road users. The fact that even a couple of seconds of distraction from the road results in a much greater likelihood of crashing has been documented and proven many times over (see Dangers of Texting while Driving and Are Hands-free Devices really safe?). Far too many innocent victims of distracted driving accidents have seen their lives hugely impacted by serious injuries or the death of a loved one. If you or a family member were injured by a careless driver and wish to seek compensation for your losses, call a knowledgeable car accident lawyer to find out about your legal rights in the matter and what’s involved in getting a favourable resolution of your case. At Injury Lawyers of Ontario, we are dedicated to helping victims of distracted driving accidents and other serious accidents get the compensation they are owed. 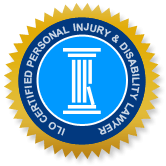 Call a respected ILO car accident lawyer to find out how we can help.